BLUEWATER LAKE – New Mexico’s big-fish story of the summer just keeps getting bigger. This time, Marcos Mata of Albuquerque owns the bragging rights with a 50.5-inch, 38-pound, 2-ounce tiger muskie, the latest in a string of state-record fish caught at Bluewater Lake. Mata’s monster muskie topped the previous state record by more than six pounds. It is the fourth time the state record has changed hands in the past year and a half. Mata caught the record fish July 23 on a two-inch Silver Minnow lure. Previous state record muskies included a 31-pound, 14-ounce fish caught by Justin Easley of Edgewood; an 18-pound, .05-ounce muskie caught by Steve Roen of Truth or Consequences; and a 17-pound, 8-ounce muskie caught by Anastasia Alfaro of Albuquerque. 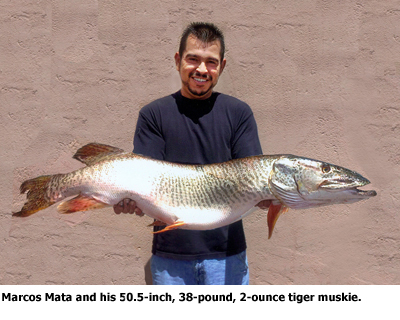 New Mexico fishing regulations allow anglers to keep one tiger muskie at least 40 inches long. Anglers are urged to handle all muskies with care, especially this time of year when water temperatures are high and the fish can become stressed when caught. Releasing fish quickly after they are hooked and keeping them in the water at all times will greatly increase their chances of survival. The Department of Game and Fish began stocking tiger muskie fry and fingerlings in Bluewater and Quemado lakes in 2003, in hopes the nonbreeding, aggressive predators would help control growing populations of goldfish and white suckers. Since then, almost 267,000 muskies have been stocked in Bluewater Lake and more than 120,000 have been stocked in Quemado Lake. Anglers who catch a fish they believe is worthy of the record books can find record applications and more information on the Department website, www.wildlife.state.nm.us.